All done! I love quick projects. Started last Thursday, finished Friday, worn out and about on Sunday. The cables are a little obscured by the variegation in the yarn, and they don’t pop as much as they would in a 3ply yarn. But you can still see them, and they’re certainly cushy! The band does sort of threaten to fall off my head, but it seems to hold itself on pretty well, at least for now. I can always thread some elastic through there if need be, later on. I have a very hard time with hats – but this one is perfect! 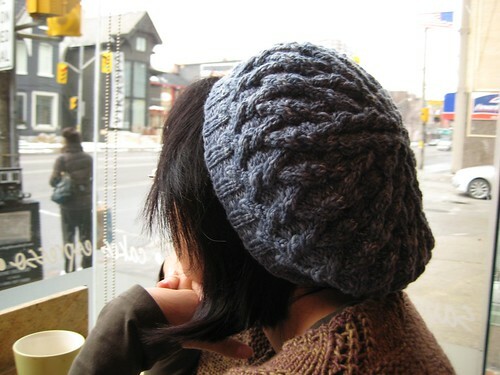 Cute cozy hat! Can’t wait to see your Tree Jacket – from what I can see, it looks adorable. You modified the neck a bit, which I love. Hope you’ll share it soon! The hat is great but I agree with Cassie, can’t wait to see the tree jacket! I see that Terra yarn at my LYS all the time and it’s all I can do not to eat it! So gorgeous! Yeah!! Gives me hope because I wanna make a Gretel too and I am not good with hats either. Cute knit… love that color! 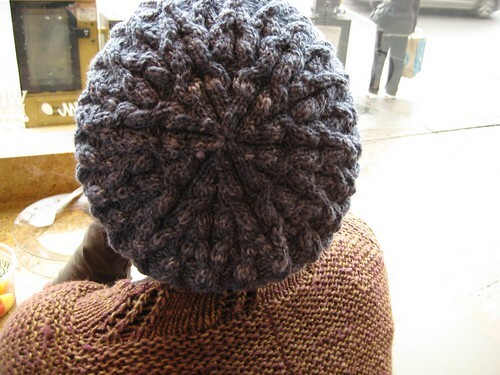 i loved making this hat too. the next one i do, i am planning on using a size 4 needle to tighten up the band. did you do the med version? and your handspun looks great! Very pretty! And the first shot is lovely, very ingenue. That is the perfect hat for you, especially with your new haircut! 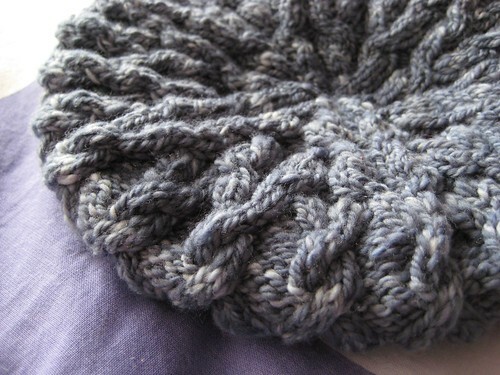 Plus, you made it with your own yarn–it can’t get any better than that! Your own dyed yarn, that should have said. I am not a big fan of tams, but I like that one! It has enough interest not to make it look flat. Thanks for sharing! It’s gorgeous! I love the photos. I see a tree jacket!!! Looks fab! Love the chunkiness! Such comfort knitting that is quick! Wow, that looks cushy and very cozy. It looks great! The handspun gives it lovely texture. Hey, I recognize the sweater peaking in on the bottom of those pics! :) Can’t wait to see it! And that hat looks so smooshy and nice.